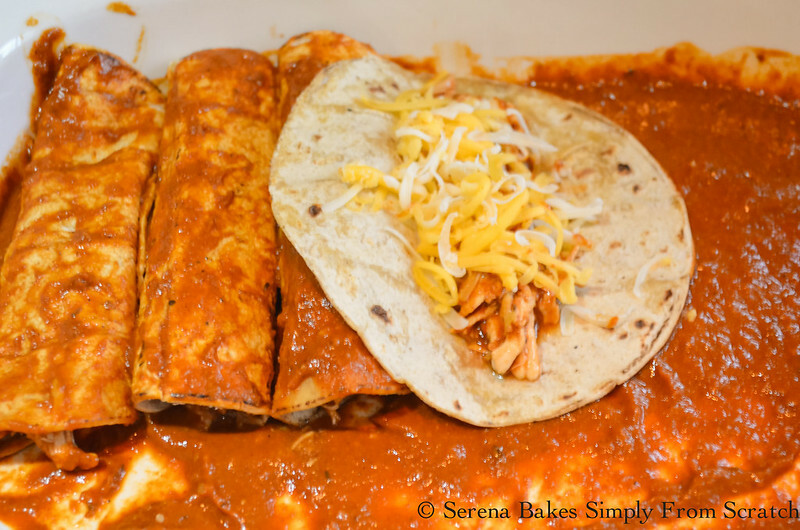 This weeks Sunday Supper theme is Captivating Casseroles and I couldn't think of a more Captivating Casserole then these Chicken Enchiladas in red sauce. 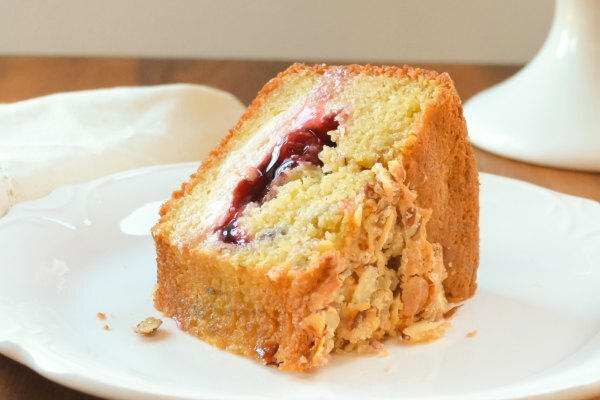 This definitely isn't the quickest recipe I've shared but I promise you they are worth every minute of your time. The whole family rates them even better then our favorite Mexican food spot, let me just tell you this is a huge thing because that's usually what the boys order. I was hoping for a few leftovers for lunch tomorrow but they were devoured in about 2.2 seconds. No matter how much food I make we seldom seem to have leftovers. I'm officially feeling like this is the story of my life. I don't know what I will do someday when the kids move out and it's just the 2 of us. I might finally be able to bring food to the neighbors! 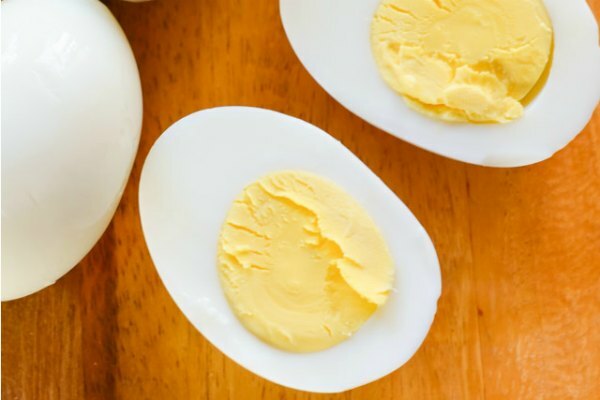 These can easily be made ahead of time and left in the fridge until ready to bake or one of those great go to recipes to bring over to someones house who's been recovering from surgery or just had a baby. This recipe is also great for those that are gluten free as long as gluten free corn tortillas are used. I hope you love this recipe as much as we do because I can never seem to make enough! In a large sauce pan heat 2 tablespoons Butter and 1 tablespoon Olive Oil over medium-high heat. 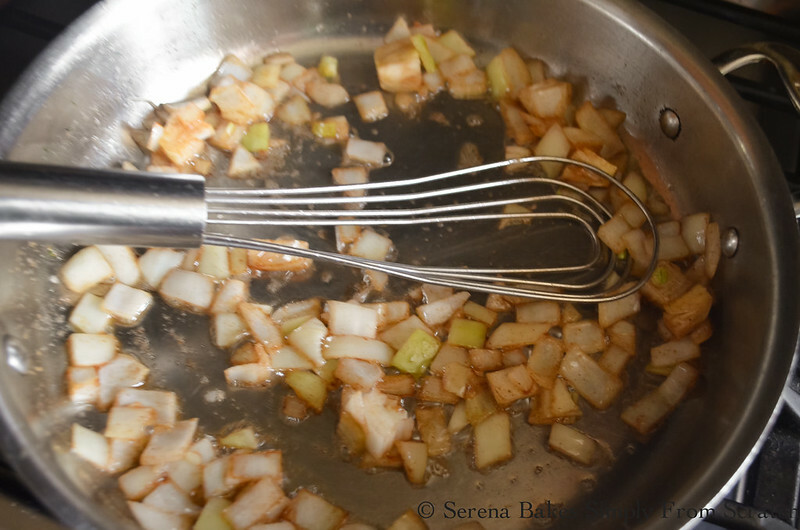 Add 1/2 Diced Onion and saute until onion starts to caramelize. Add 3 cloves Minced Garlic, 1/3 cup Chili Powder and 2 1/2 tablespoons Corn Flour, stir until fragrant about 45 seconds to 1 minute. Slowly stir in 2 cups Chicken Stock and 1 cup Water until smooth. 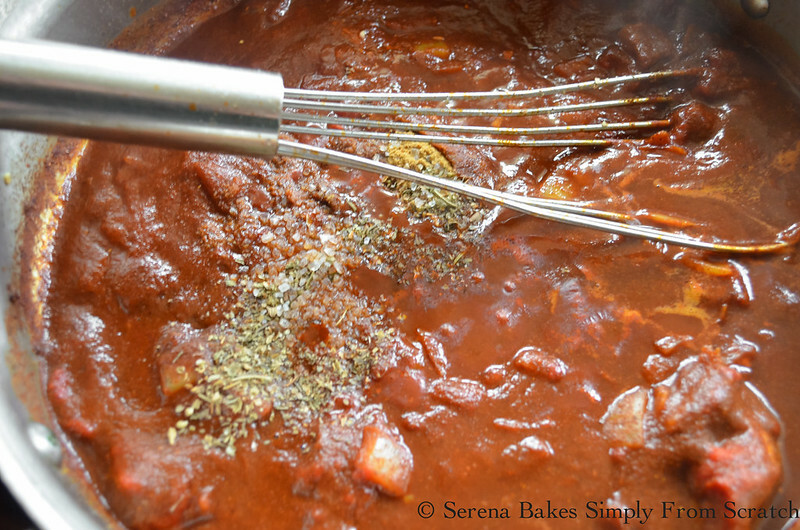 Add 6 ounces of Tomato Paste, 1 teaspoon Oregano, 2 teaspoons Cumin and 1/2 teaspoon Salt. Bring to a simmer and cover. Cook for 10 minutes. Remove 1 cup of the sauce to cook chicken. Puree remaining sauce in a blender or food processor. To cook the chicken add the 1 cup of unpureed enchilada sauce, an additional 1/2 cup of water and about 1 1/2 lbs of Chicken Breast (These just happened to be huge!). Cook chicken for 30-45 minutes until chicken easily shreds with a fork. Using 2 forks shred chicken in sauce and set aside. In a lightly greased pan heat corn tortillas one at a time until soft enough to roll over medium-high heat. 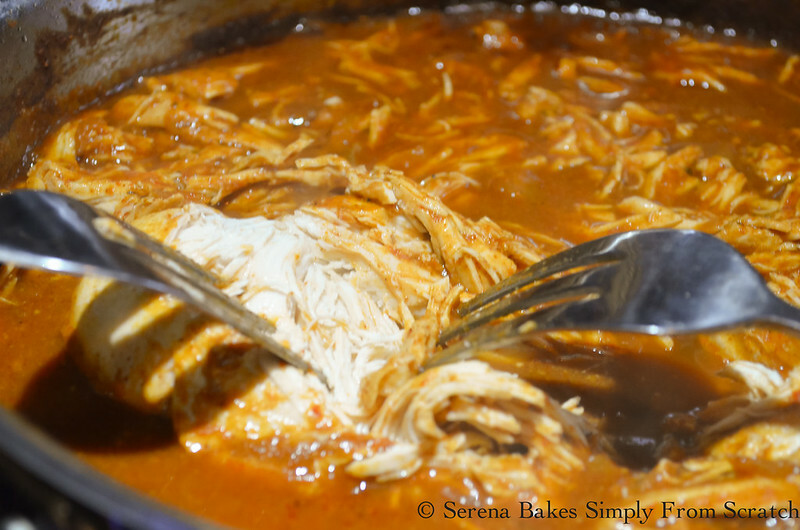 Spread 1/3 of the pureed Enchilada Sauce in the bottom of an 11"x15" pan place a hot tortilla into the pan and add about 3 tablespoons Pulled Chicken Mixture With Sauce and 2 tablespoons Grated Cheese (Half Jack/Half Cheddar). Roll tightly, place seem side down and repeat until pan is full. This can also be made into 2 smaller pans. Cover filled Enchiladas with remaining Enchilada Sauce and 1 cup Shredded Jack Cheese and 1 cup Shredded Cheddar Cheese. Bake in a 350 degree oven for 25-30 minutes until cheese is melted. Serve with Refried Beans (Refried Black Beans Recipe coming later in the week), Restaurant Style Mexican Rice, Cilantro Lime Rice, Guacamole, Sour Cream, Pico De Gallo and Fresh Sliced Limes. Make sure to check out all the other AMAZING Sunday Supper Captivating Casserole Recipe links under the recipe for more great ideas! 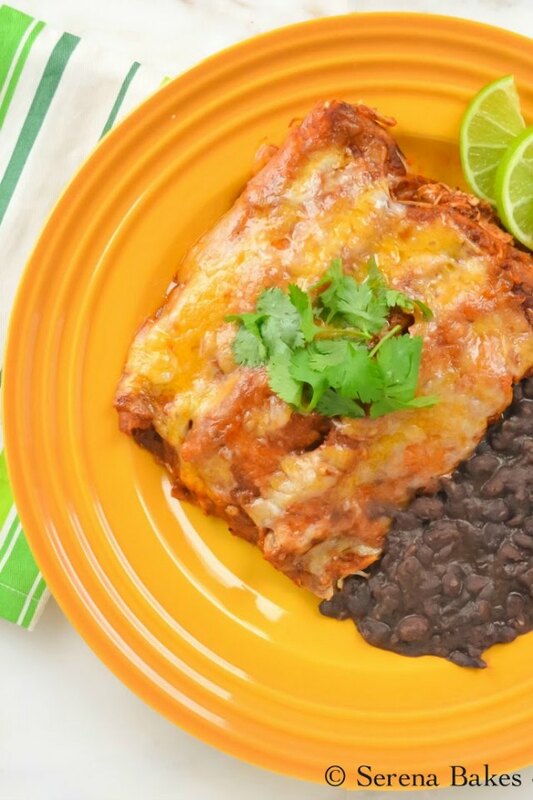 These Chicken Enchiladas in Red Enchilada Sauce are cooked in homemade enchilada sauce and will quickly become a favorite. These are perfect for superbowl parties, company or to bring to someone who's recovering from surgery or having a baby. In a large sauce pan with lid heat butter and olive oil over medium-high heat until melted. Add onion and cook until caramelized. Stir in garlic, chili powder and corn flour, cook until fragrant about 45 seconds to 1 minute. Slowly stir in chicken stock and water until smooth. Add tomato paste, oregano, cumin, and sea salt. Stir until smooth, and bring to a simmer, cover. Cook over low heat for 10 minutes. Remove 1 cup of sauce, and set aside for chicken. Puree remaining sauce, and set aside. 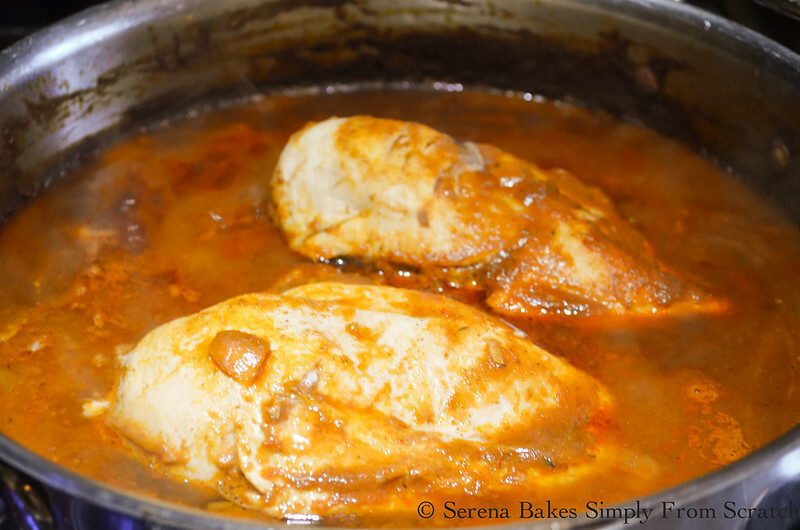 Place the 1 cup of sauce back into the saucepan, 1/2 cup water, and chicken breast. Bring to a simmer. Cover and cook for 30-45 minutes until the chicken easily shreds with a fork. Using 2 forks shred chicken in sauce, and set aside. Combine both cheeses, and set aside. 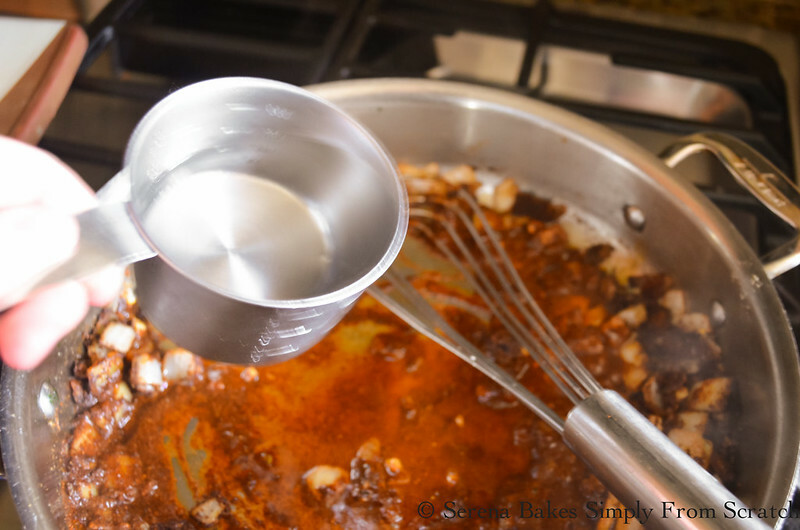 Pour 1/3 of the pureed enchilada sauce into an 11"x15" pan or 2 smaller pans equivalent. 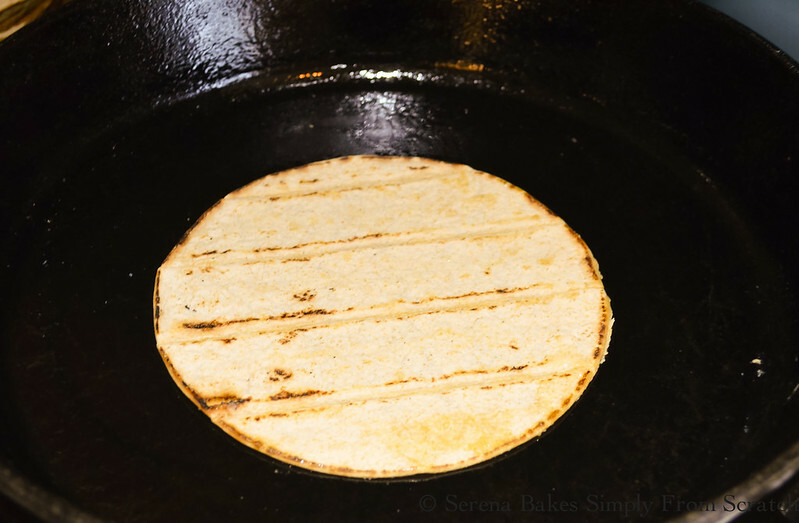 Lightly grease a heavy duty frying pan with oil and heat corn tortillas on each side until soft enough to roll. Place a hot tortilla into the pan and add about 3 tablespoons pulled chicken mixture with sauce and 2 tablespoons grated cheese. Roll tightly and place seem side down. Repeat until pan is full. 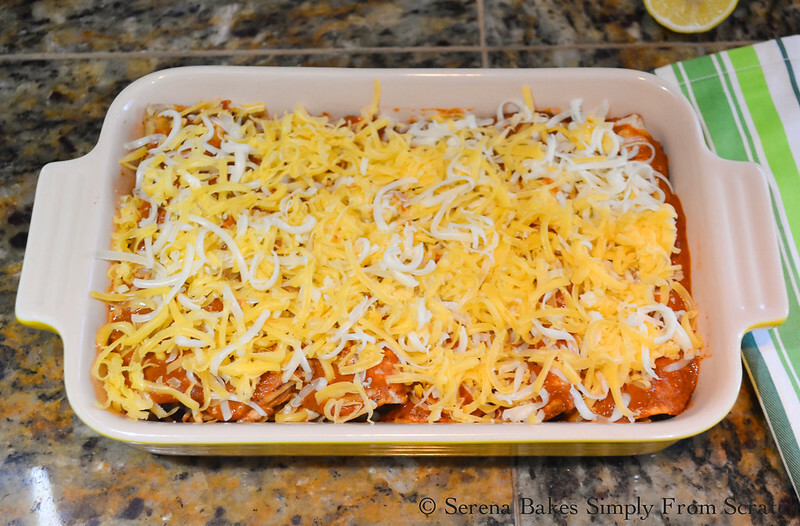 Cover filled enchiladas with remaining sauce, and then with cheese mixture. Bake for 25-30 minutes until cheese is melted. Calories Calculated using myfitnesspal without additional toppings for serving. Beats any chicken enchiladas I've ever seen or had at any Mexican restaurant. 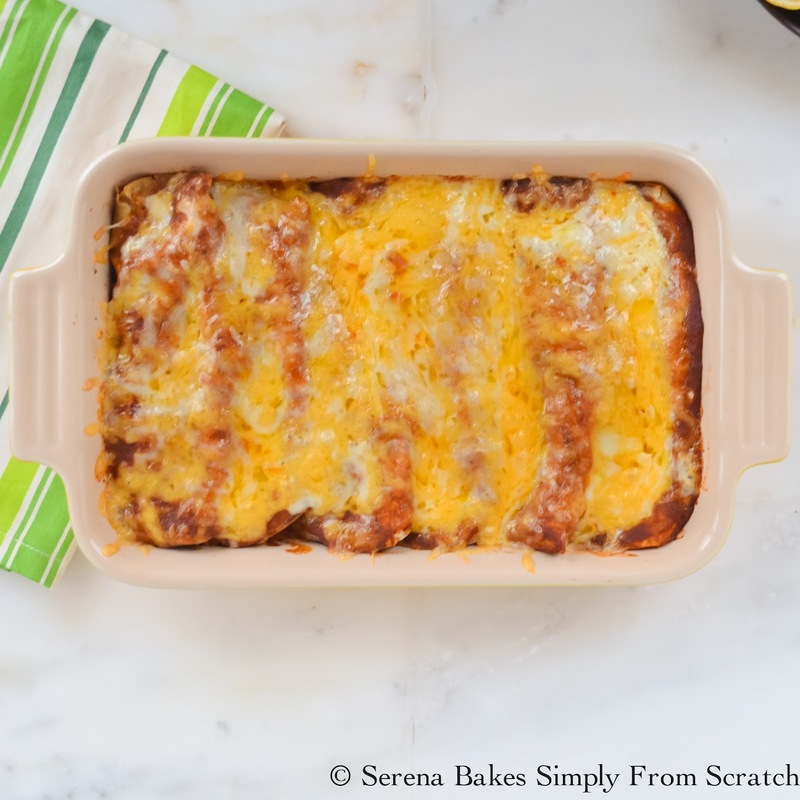 I have a chicken enchilada recipe which uses about 6 pans and mixing bowls, but it's amazing! Your recipe looks just as wonderful!!! You've inspired me to add these to the menu ASAP! We love enchiladas, too. It's funny, I wouldn't have called them a casserole! ;) I love your recipe. 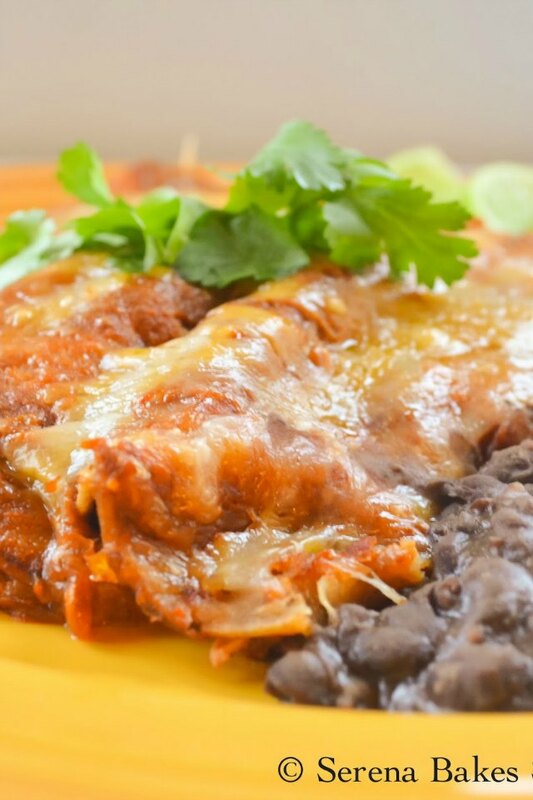 Enchiladas are a favorite of ours, we probably have them two or three times a month in some form ;) Yours look perfect! I love enchiladas. They are super tasty and delicious. I'm also a HUGE fan of corn torillas instead of flour for enchiladas. So tasty! YUM! This looks so delicious, I want to face-plant into the entire dish, right now!! My daughter is a huge enchilada fan. She would be so happy if I made these for dinner. Those beautiful colors in your photos captured my attention before I could even focus on what was on the plate! :) You're right, enchiladas do take a bit of time to make, but they are definitely worth the extra effort. I like that you used corn tortillas; they seem to taste so much better than do the flour ones. Great recipe! This is my kind of casserole. Everything about it sounds just perfect! I've never made my own enchiladas before, this sounds so yummy. I could easily make a vegetarian version! Hey Serena. This looks great! 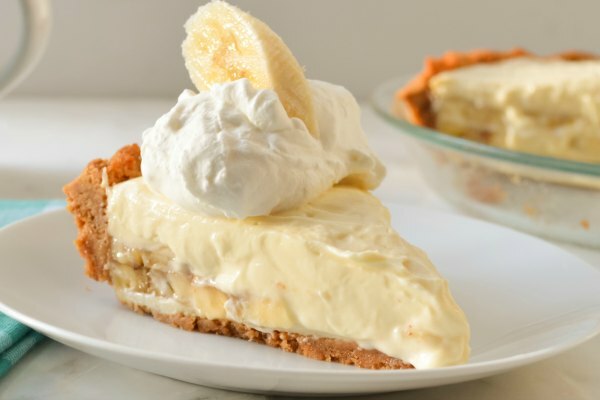 I saw this on Foodgawker yesterday. Congrats! We love chicken enchiladas in my house. Made them last night. Your's look great. Let me ask, because I cheat and do not grill the tortillas, how necessary is that step? These look perfect! I need to try them soon, like tomorrow! What brand of chili powder did you use? Chili powders vary significantly.